I’m a sucker for a great title, a tendency that’s yielded a bumper crop of disappointments through the years; I still haven’t purged the memory of a Screaming Broccoli album I purchased in 1988, or the 90 minutes I spent watching So I Married an Axe Murderer. I’m pleased to report That Time I Got Reincarnated As a Slime proved a better gamble than punk-rock vegetables, offering enough solid jokes and weird plot developments to sustain this reader’s interest. What surprised me the most about Reincarnated, however, wasn’t the premise — that’s clearly advertised in the title — nor the hero’s appearance — again, see title — but the story’s fundamentally optimistic message: there are always second chances in life. The first chapter introduces us to Mikami, a 37-year-old virgin trapped in a lousy job. On a fateful afternoon, he impulsively saves a junior colleague from a knife-wielding attacker, an act of heroism that costs Mikami his life — as a human being, at least — and leads to his reincarnation in a fantasy realm that looks remarkably like World of Warcraft, Game of Thrones, and a hundred MMORPGs. 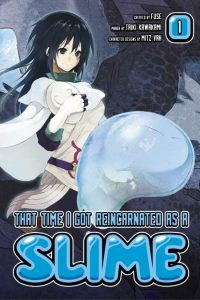 Guided by an unseen dungeon master, Mikami reinvents himself as Rimuru, a slime monster who absorbs his enemies’ powers by eating them — a trick that quickly enables Rimuru to do remarkable things from healing the wounded to spinning thread. What’s more remarkable about Rimuru is that he immediately puts his powers to work — for other people. (Well, monsters, really.) In chapter two, for example, he teaches a community of goblins how to defend themselves against a numerically superior opponent, helping them build sophisticated fortifications that repel a snarling pack of direwolves. (Paging George R.R. Martin!) Rimuru also bestows names on each member of the tribe, an act that transforms the once small and homely goblins into strapping specimens. That would be a good joke in and of itself, but it lands with greater impact because Rimuru’s act of generosity is consistent with what we saw of his human self, both in the prologue and in a brief flashback to his interactions with colleagues. What Paul’s translation can’t do is goose the pacing. Manga-kaTaiki Kawakami makes a game effort to handle the first volume’s exposition as efficiently as possible, which results in many static panels of Rimuru learning the rules of play from the unseen dungeon master. Though the dialogue is punchy, the story unfolds in fits and starts, seesawing between short, intense bursts of action and leisurely scenes of Rimuru chatting with other characters, pondering one of his new-found abilities, or describing something that happened off camera. These info-dump passages are all the more tedious because Rimuru lacks the limbs, eyes, or mouth to adequately register surprise or awe at what he learns; what features he has — two pencil-line eyebrows — are frozen in a perma-scowl. For all its flaws, however, Reincarnated has its heart in the right place, using Rimuru’s adventures to demonstrate that it’s possible to make the most of any situation, no matter how improbable or unpromising it may seem at the outset. Better still, Reincarnated imparts its moral with tongue firmly in cheek, never lapsing into sappy earnestness about doing one’s best, or sacrificing yourself for the greater good. Of course, we haven’t seen what will happen if and when Rimuru stumbles into a second chance at romance, though volume one offers a few tantalizing clues about a future love interest. Here’s hoping that Rimuru begins his second — and potentially more terrifying — journey of romantic self-discovery without losing his wit or his wits. THAT TIME I GOT REINCARNATED AS A SLIME, VOL. 1 • CREATED BY FUSE • MANGA BY TAIKI KAWAKAMI • CHARACTER DESIGNS BY MITZ VAH • TRANSLATED BY STEPHEN PAUL • KODANSHA COMICS • RATED: TEEN (13+) • 240 pp.